FirstMate's Grain Free cat diets are a wonderful choice for kittens or cats at all stages of life. These simple, limited ingredient diets allow for easy digestion and a reduced chance of allergic reaction. 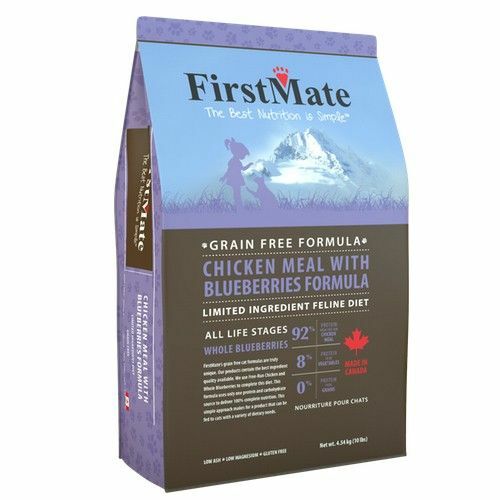 FirstMate's grain and gluten free cat diets are loaded with fresh blueberries which provide a nutritional source of antioxidants. Blueberries promote a healthy immune system, urinary tract, increase eyesight and memory function, and provide a source of dietary fiber. All FirstMate formulations are manufactured at our family owned facility located in Chilliwack, B.C., Canada, with care. Ingredients: Chicken Meal, Potato, Chicken Fat (preserved with mixed tocopherols), Whole Blueberries, DL-Methionine, Minerals: (Zinc Proteinate, Iron Proteinate, Manganese Proteinate, Copper Proteinate, Calcium Iodate, Cobalt Carbonate, Sodium Selenite), Vitamins: (Niacin, Thiamine Mononitrate, D-Calcium Pantothenate, Riboflavin, Pyridoxine Hydrochloride, Folic Acid, Biotin, Vitamin B12 Supplement, Vitamin E Supplement, Vitamin A Supplement, Vitamin D3 Supplement), Potassium Chloride, Calcium Propionate (a preservative), Taurine, Yeast Extract (a source of prebiotics), Kale, Glucosamine Hydrochloride. Ingredients: Wild Herring Meal and/or Wild Anchovy Meal and/or Wild Sardine Meal, Potato, Chicken Fat* (preserved with mixed tocopherols), Whole Blueberries, Dicalcium Phosphate, Dl-Methionine, Choline Chloride, Calcium Propionate, Yucca Plant Extract, Minerals (Zinc Proteinate, Iron Proteinate, Manganese Proteinate, Copper Proteinate, Iodine, Cobalt, Selenium), Vitamins (Vitamin C, Vitamin E, Riboflavin, Niacin, D-Pantothenic Acid, Thiamine, Vitamin A, Pyridoxine, Folic Acid, Biotin, Vitamin B12, Vitamin D3), Taurine, Glucosamine. *The chicken fat used in FirstMate Pet Foods is processed free of protein, eliminating the risk of allergies derived from chicken.